Larry Smarr, director of the California Institute for Telecommunications and Information Technology (Calit2), will speak at UC Santa Cruz on Thursday, March 22. Smarr's talk, "How Global-scale Personal Lightwaves are Transforming Scientific Research," is the first in a Distinguished Lecture Series sponsored by UCSC's Baskin School of Engineering. The event, which is free and open to the public, will take place at 2 p.m. in the Simularium (Room 180) of the Engineering 2 Building on the UCSC campus. Smarr is the Harry E. Gruber Professor in the Department of Computer Science and Engineering at UC San Diego. 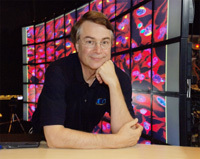 As founding director of the National Center for Supercomputing Applications (NCSA) in 1985 and the National Computational Science Alliance in 1997, Smarr has driven major contributions to the development of the national information infrastructure: the Internet, the web, the emerging Grid, collaboratories, and scientific visualization. As director of Calit2, Smarr has led the deployment of novel large-scale "living laboratories" to study how emerging distributed information technologies and telecommunications can improve California's future by helping researchers address issues such as traffic congestion, earthquake monitoring, biomedical informatics, and the state water system. Smarr received his Ph.D. from the University of Texas at Austin and conducted observational, theoretical, and computational based astrophysical sciences research for 15 years before becoming director of NCSA. He is a member of the National Academy of Engineering and a Fellow of the American Physical Society and the American Academy of Arts and Sciences. In 1990 he received the Franklin Institute's Delmer S. Fahrney Gold Medal for Leadership in Science or Technology. Smarr has served on the President's Information Technology Advisory Committee, the Advisory Committee to the Director of the National Institutes of Health, and the NASA Advisory Council. He served as chair of NASA's Earth System Science and Applications Advisory Committee and was the first chair of the newly formed NASA Science Advisory Council. For more information about this lecture, call (831) 459-2158 or e-mail drecept@soe.ucsc.edu. Information about this and other upcoming events at the Baskin School of Engineering is also available on the school's online calendar.